In the span of just over 5 years and 5 months, the S&P 500 index of U.S. stocks has tripled from its March 9, 2009 closing low. Today it breached the 2000 mark for the first time ever. 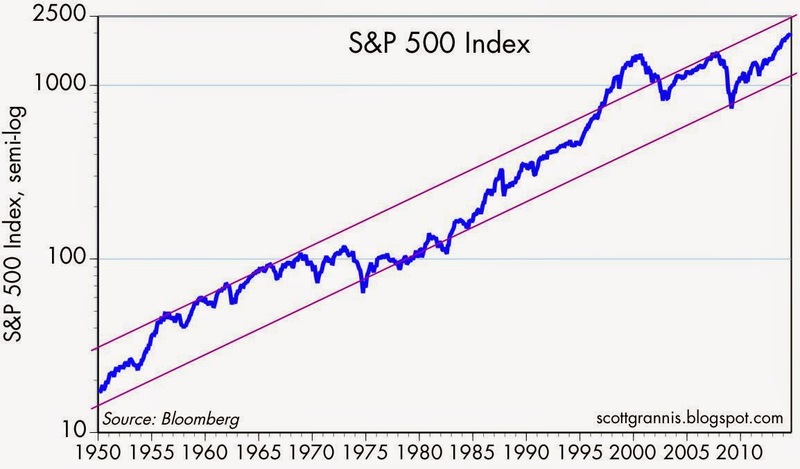 Its long upward march over the decades remains intact, with yet more room on the upside. 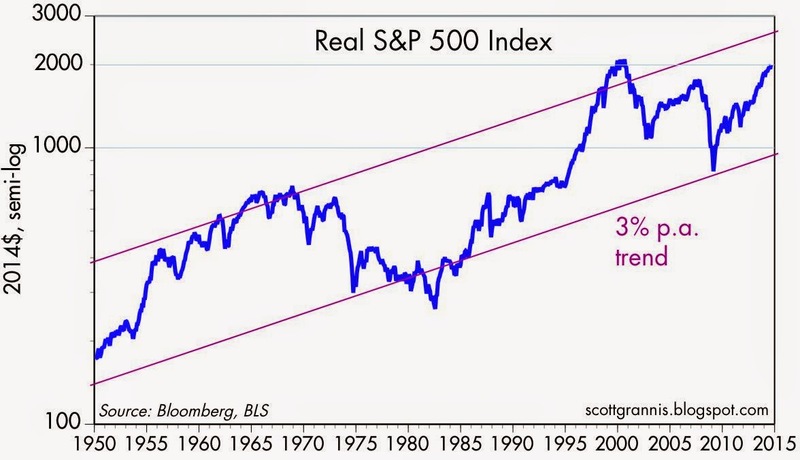 In real terms, however, the S&P 500 is still about 5% shy of its all-time set in August 2000, as the graph above shows. Relative to nominal GDP, stocks today are around the same level as they were in the early 1960s. Back then inflation was low and stable, and 10-yr bond yields were 4% and relatively stable. However, real growth in the early 1960s was relatively robust, averaging 5-6% per year, whereas now real growth is only about 2% or so. After-tax corporate profits in the early 1960s were 7-8% of GDP, whereas currently they are 9-10% of GDP, thanks largely to huge growth in overseas profits, which in turn is a function of rapid growth in emerging market economies. So although real growth today is much slower than it was back in the early 1960s, corporate profits are much stronger, and Treasury yields are much lower. All things considered, it's hard to find anything here that is seriously out of whack. We have reduced our cash position by nearly 60%.. I wish there was an easy way to factor in stock buybacks. In the 1960s dividend payouts were much higher. Today, half of the returns to capital are in the form of buybacks, which should be causing an upward drift in index values, as capital returned to owners ends up being accounted for as capital gains instead of dividend income. 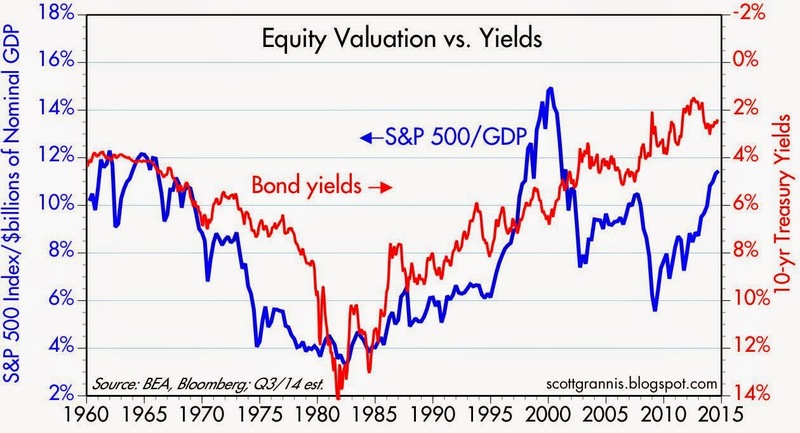 I don't have a problem with buybacks, but don't you think it kind of complicates these historical comparisons?